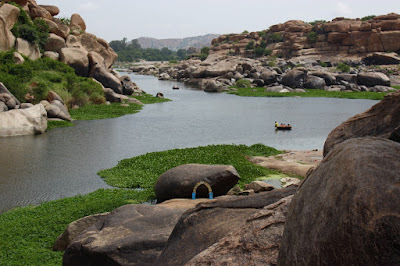 The second day of our Hampi tour we started with Sasivekalu Ganesha. We moved on to explore the gateway and temples on Hemakuta hill and reached Virupaksha temple. Having spent some time at Virupaksha temple, we went towards the river. I remembered visiting one spot during my first visit in 1996. 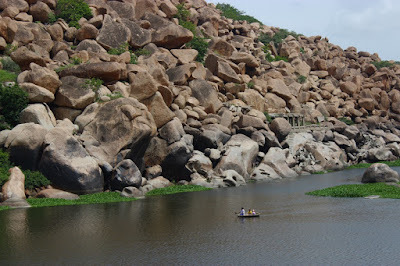 At that spot Tungabhadra flowed through the rock formations ..I wanted to see that spot again. 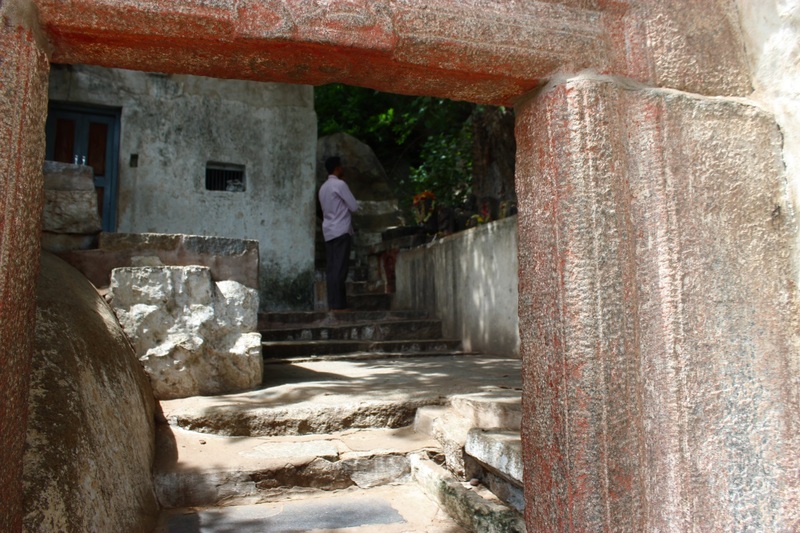 On inquiring a local person told us to go to Rama Laxmana temple which is about a kilometer from Virupaksha temple. 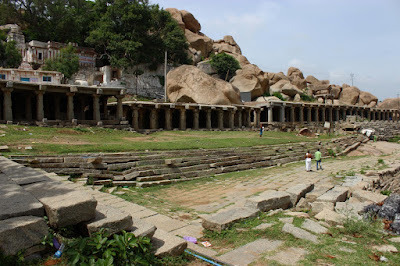 I thought the spot was close to Virupaksha temple ..well lets check out Rama temple then. So we walked through the narrow streets of Hampi village ..guest houses, garment shops, jewelry shops, foreign tourists ..it was a different world. in there. 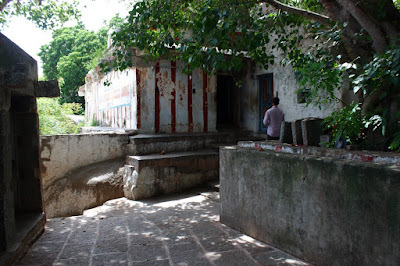 We reached the end of Virupaksha market street and turned left into the path leading to Rama Laxmana temple. Tungabhadra came into view, a lovely sight it was. 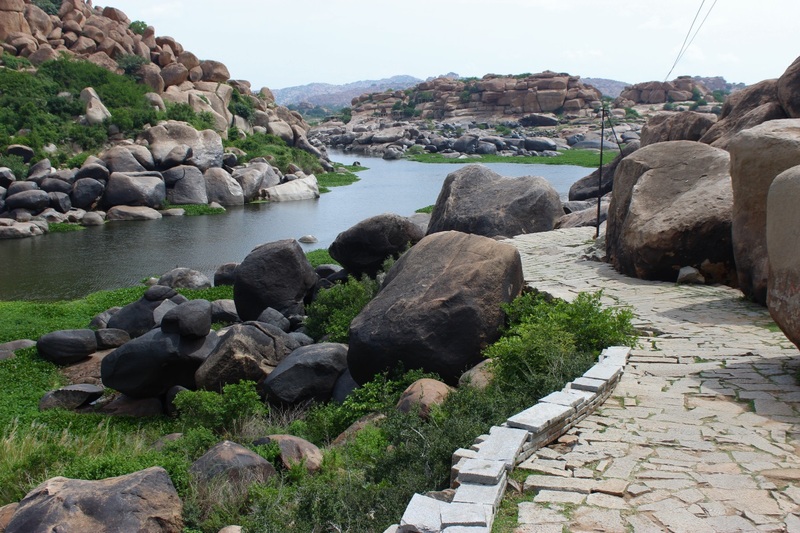 The foot path wound along the rock formations. It was silent, hardly any people at this time. This spot known as Chakra Teertha. Here the river changes it direction and flows in north-east direction. 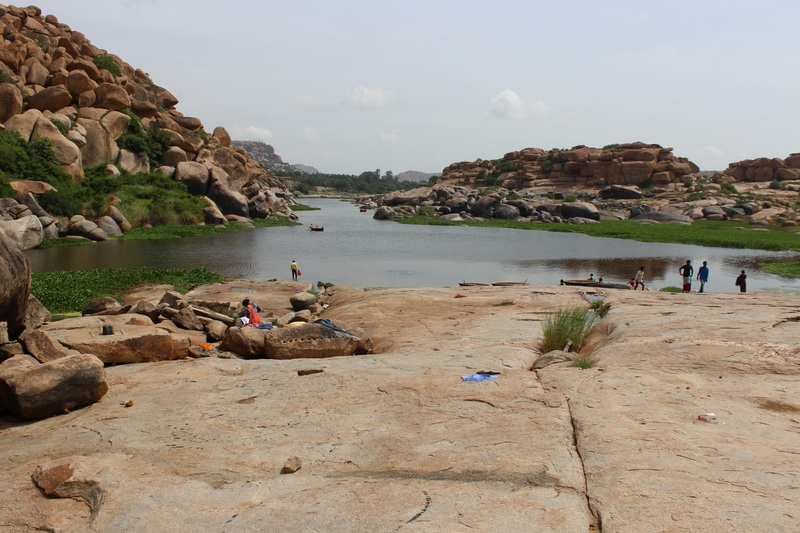 This spot is considered holy and people flock to this spot to bathe. It was nice to see the coracles on the calmly flowing water. 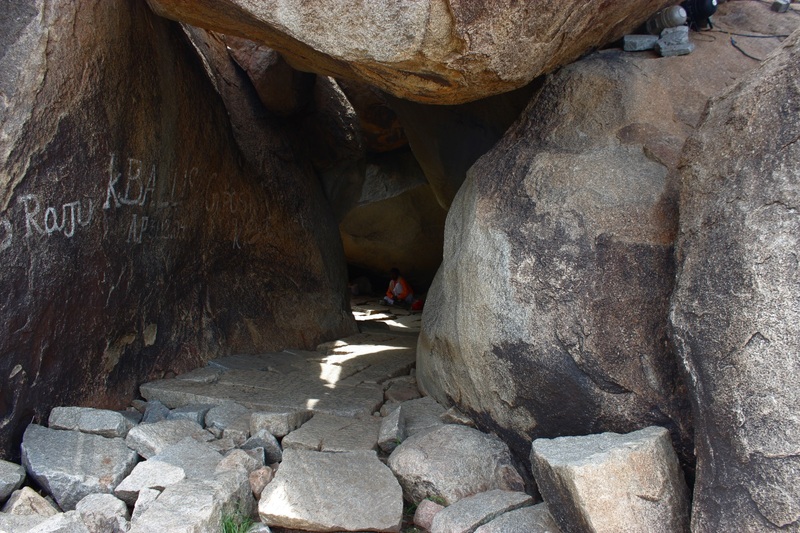 The temple path passed through the rocks, a small cave like formation. This spot is truly convenient for bathing and swimming too. Of course, one needs to be careful. The water marks showed how high the water flowed. The lighter shades on these rocks is due to contact with water. I was imagining the sight when the water level was 15 feet higher ..I wouldn't be standing here. On my right is the temple. There it is.. Kodandarama temple. 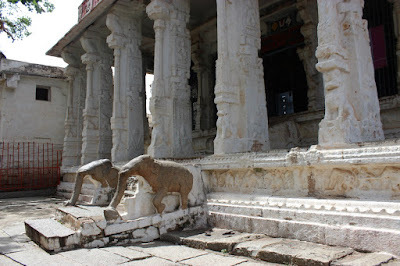 It was a small, simple structure but the pillars are tall. On the right is the bathing ghat and shelter for pilgrims. The arrangement indicates this was an important shrine. 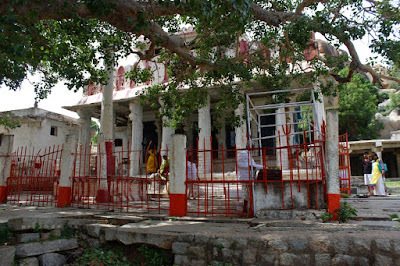 According to legends, the temple marks the place where Rama crowned Sugreeva as the king of Kishkinda. 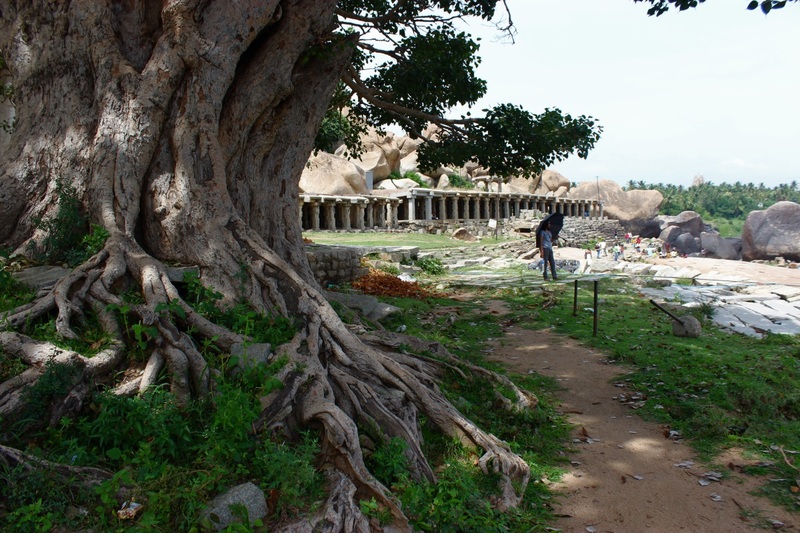 The bathing ghat is about 90 meters long. Behind and above in the rock is a clump of trees, that's where another important shrine is i.e. 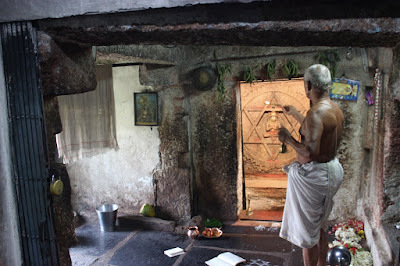 Yantroddharaka Anjaneya Devasthana. We stood in the shade of the massive Banyan tree opposite Kondandarama temple, the tree must be hundred years old. 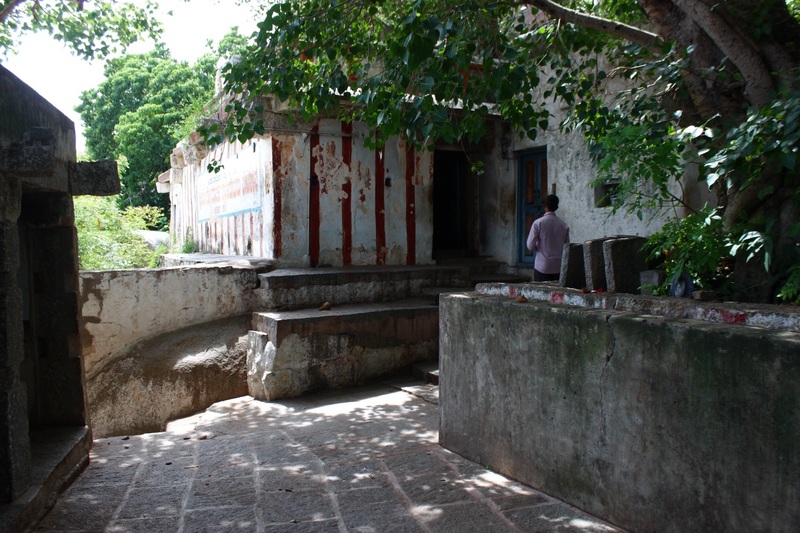 The shaded yard of the temple. Truly this spot is peaceful. The temple entrance. Inside are idols of Laxmana, Rama and Seeta carved on a massive boulder. The idols are at least 10' tall. Among the rocks of Chakra Teertha are other temples on either sides. Its amazing to see the structures nestled among the rock formations. Wondering how the construction work was carried out. Amazing. 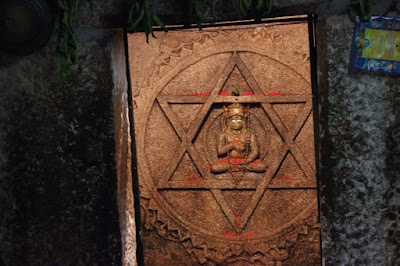 That's the deity ..Lord Hanuman at the center of a hexagram. Like Kodandarama temple, the idol here is also carved on a boulder. The idol has an interesting story which I read on Hampi Online. I'm quoting the story as is..
One of the Hanuman idols installed by Vyasaraja is deep in the jungles near Yellapur, at Hanumana Kote. In the areas enclosed by the segments are Telugu or Kannada text. Its a lovely drawing. Perfect circle, straight lines and angles. What techniques did those sculptors possess to create such an art ..definitely extraordinary. 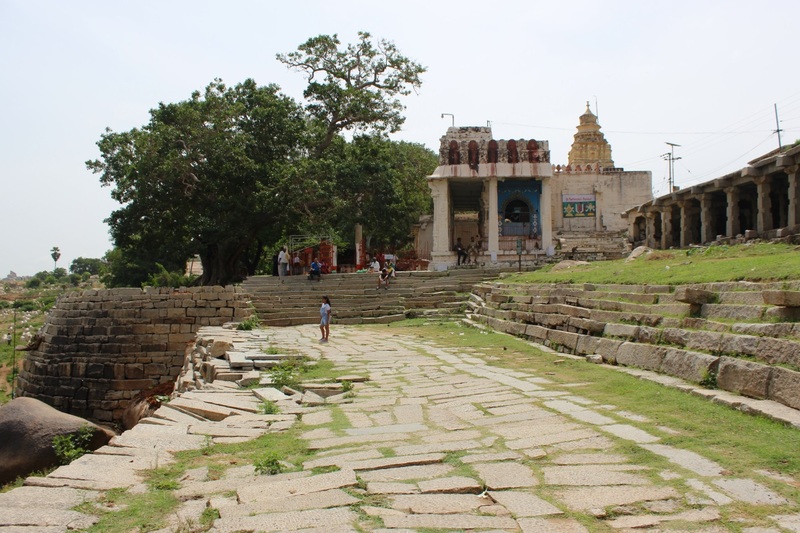 From here we planned to explore further ..spots which have to be reached by foot like Varaha temple, Vyasaraja Matha, King's Balance, and many more. 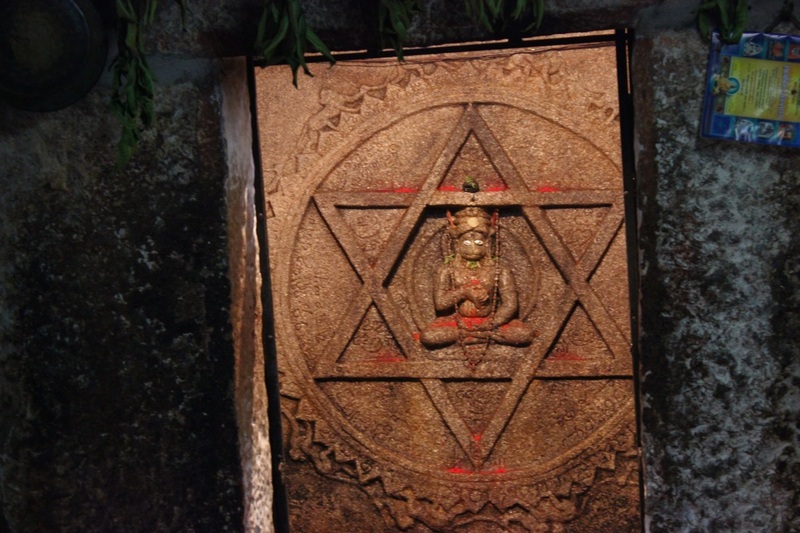 Interesting, something I see in the triangles of Yantra, what are those?